The Reversible Medieval Robin Hat is the perfect topper for a multitude of medieval, Renaissance, and fantasy looks. 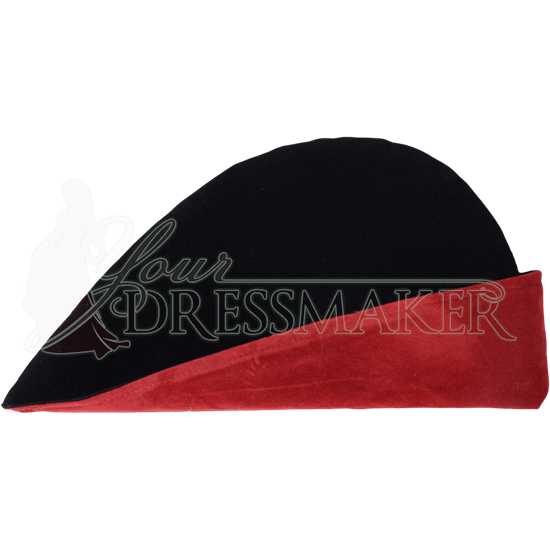 Made of a soft suede texture fabric, this pointed medieval cap comes in a variety of colors to match your outfit. One side of the hat is always black, while the other is your color of choice. Completely reversible, the brim is typically worn upturned to show the side worn underneath. This historical hat style was made famous by popular depictions of Robin Hood, but was worn by both men and women of nobility as well as merchants. Whether your character is a woodland archer, townsperson, adventurer, or noble, this suede medieval cap makes a fine accessory. We recommend cold washing. Wash with a gentle machine action using a 1/2 load with a short spin. Maximum water temperature 85° F / 30° C. Please use a gentle washing powder.